You may have to be at least 18 to buy cigarettes in the U.S., but children as young as 7 are working long hours in fields harvesting nicotine- and pesticide-laced tobacco leaves under sometimes hazardous and sweltering conditions, according to a report released Wednesday by an international rights group. The Human Rights Watch report, "Tobacco's Hidden Children: Hazardous Child Labor in US Tobacco Farming," details findings from interviews with more than 140 children working on farms in North Carolina, Kentucky, Tennessee and Virginia, where a majority of the country's tobacco is grown. The group acknowledges that most of what it documented is legal under U.S. law but aims to highlight the practice and urge both governments and tobacco companies to take further steps to protect children from the hazardous harvesting of the cash crop that has built businesses, funded cities and influenced cultures. Children interviewed by the group in 2012 and 2013 reported vomiting, nausea and headaches while working on tobacco farms. The symptoms they reported are consistent with nicotine poisoning often called Green Tobacco Sickness, which occurs when workers absorb nicotine through their skin while handling tobacco plants. The children also said they worked long hours — often in extreme heat — without overtime pay or sufficient breaks and wore no, or inadequate, protective gear. According to the report, U.S. agriculture labor laws allow children to work longer hours at younger ages and in more hazardous conditions than children in any other industry. 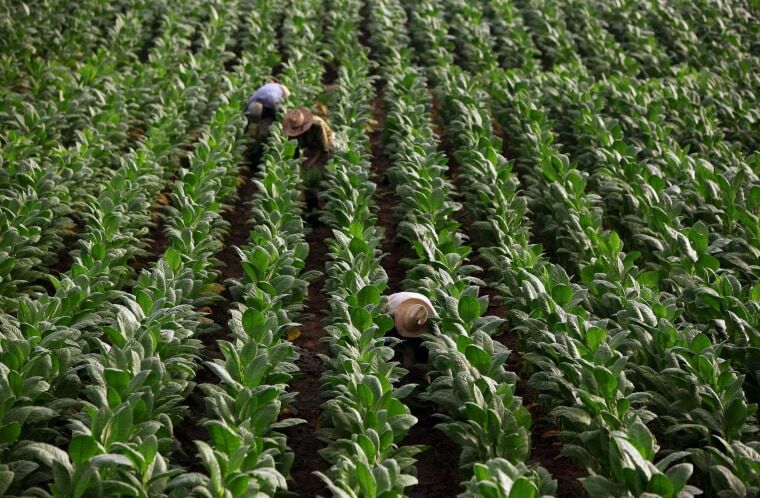 In 2011, the Labor Department proposed changes that would have prohibited children under 16 from working on tobacco farms, but they were withdrawn in 2012. Human Rights Watch met with many of the world's biggest cigarette makers and tobacco suppliers to discuss its findings and encourage them to adopt or strengthen policies to prevent the practices in their supply chains. The companies are concerned about child labor in their supply chains and have developed standards, including requiring growers to provide a safe work environment and adhere to child labor laws, the group said.